NASL: Washington remained the only undefeated team in the league after a 2-1 win over Philadelphia as previously unbeaten Vancouver was blanked 2-0 by Portland. The Diplomat victory, on two goals by Striker Leroy Deleon, put the team in a tie with Tampa Bay for second in the Eastern Division, behind Miami. 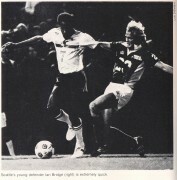 The Rowdies topped Boston and Hartford, both by 3-1, with Clyde Best accounting for half of Tampa Bay's scoring. Miami Striker Steven David had two goals for a league-leading total of nine in five games in the Toros' 4-2 defeat of Boston. Seattle won twice, 3-1 over Los Angeles and 1-0 over Dallas, but still trailed Vancouver in the West. No team in the division is below .500, while in the North no team is above it. St. Louis took a commanding lead over Denver in the Central division, beating Philadelphia 2-1 in a tie breaker. In other action, San Jose beat San Antonio 2-1, Chicago nipped Los Angeles 1-0, Denver stopped Portland 3-1 and Hartford scored a 2-1 tie-breaker win over New York.